While small fridge plants respond readily to varying loads, it becomes desirable to reconcile capacity and demand more economically as heat flows increase. For example, the 85 kW air-cooled chiller in the photo serves an application cycling to several times its rating. By smoothing-out peaks and troughs between process load and chiller rating, push-pull flow across one of our coolant management modules (shown below) matches refrigeration capacity against prevailing conditions. 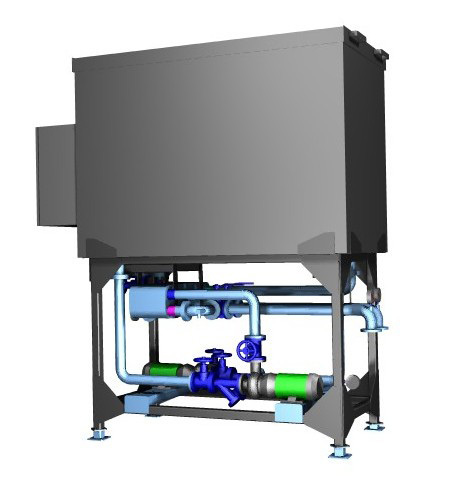 It presents the chiller with a relatively constant load near to its design point, so that the machine runs at best available efficiency at a steady - but much smaller – loading. Dove Thermal's long experience with conveyor-line drying and air quenching tunnels extends from corn snack manufacture and chocolate enrobing through to engine cylinder block casting and sintered component production. Tunnel sections may be used for raw materials preparation, intermediate stage conditioning and product finishing, and wherever a process is to be contained. A drying tunnel may be fitted either with local bridge-mounted solvent handling and recovery equipment, or ducted to remote systems. 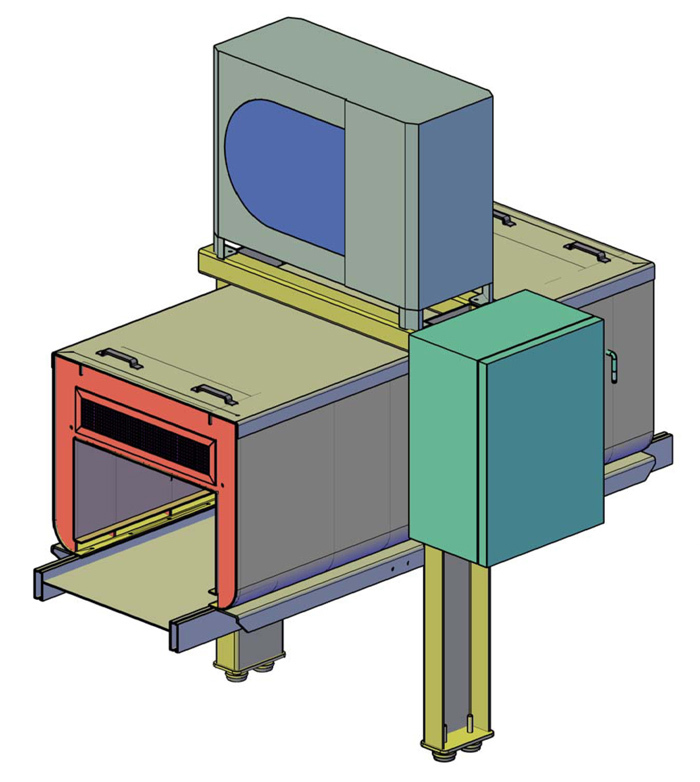 The isometric above shows a chilled-air cooling tunnel section with integral entry and exit air curtains to contain the cooled and dehumidified tunnel air mass. These suppress the humid transfer that would otherwise be caused by the vapour pressure gradient between conditioned and ambient air, maintaining a stable and controllable micro-climate in the tunnel section. The design shown also features a proprietary bridge-mounted condensing set, and continuous internal slot nozzles for edge-on air delivery. 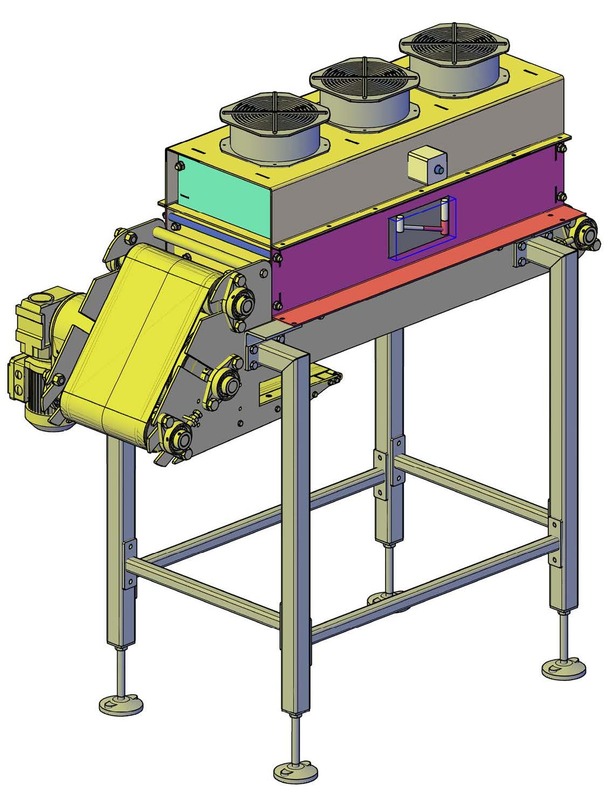 Assemblies may also be configured for vertical impingement of cooling air onto the conveyor band, or as both a drying and cooling tunnel for product conditioning. While supply temperatures might be less critical for an air quenching tunnel, they generally handle higher throughputs - which might entail provision of noise attenuation equipment. We have designed and built various types of refrigeration plant and machinery, such as the revolutionary diesel-electric nosemount chiller for HGV semi-trailers, and the chilled water accumulator installation (below). We have developed unique self-jigging fabrication methods for the construction of HVACR assemblies, which have been successfully extended to the manufacture of sections for product conditioning tunnels and the construction of air quench tunnels. They exploit recent advances in CIM laser profiling and sheet metal forming to produce precision-built equipment with near off-the-shelf availability.